“One of Fermilab’s major future projects, the Long-Baseline Neutrino Experiment (LBNE), achieved a significant milestone this week. 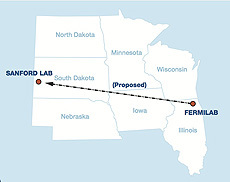 The U.S. Department of Energy on Monday granted Critical Decision 1 approval to the first phase of LBNE, which includes construction of a beamline at Fermilab and a near-surface far detector at the Sanford Lab in Lead, S.D. Plans for LBNE underwent three different reviews in the past two months before reaching the desk of William Brinkman, director of the Office of Science, who made the final decision to grant CD-1 approval.